Sorry about last week, but I took the day off for Father’s Day and spent it with family. I have received many calls about what is happening with the fishing. To start off, we are now into full summer weather with temperatures in the 90s and up to 104 degrees. You can imagine what that is doing to the water; yep you're right, the water is warming up and the bite is going off. The last time I wrote to you the Springers were on the move and there was plenty of action, but with the water flows dropping and the water temps going up, the fish are looking for nothing but cool water. 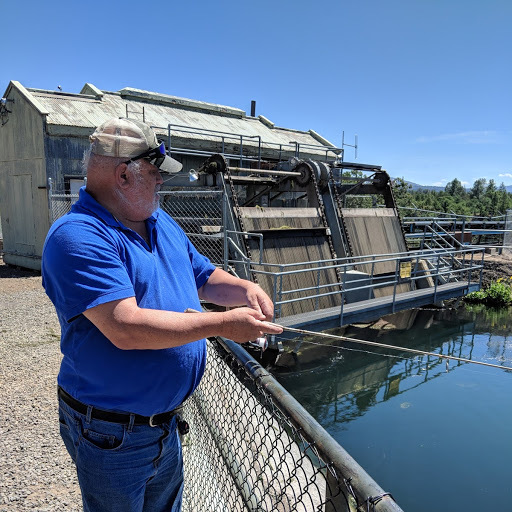 Right after the last column, I got a report from Patrick up at Del Loma RV park, that the salmon bite was red hot and the camp was bringing in lots of nice salmon about 5 to 8lbs; but when the temperatures went up, the bite disappeared. There is still some good fishing up and down the Trinity, but it is early-early morning, in the deep cool holes and stops when the sun hits the water. Grey's and Burnt Ranch Falls has really slowed down, but I have seen fish still coming out. Most of the fishermen are complaining about the fishing being slow and hard. The Kids Fish Derby up at Fish Lake was great. It started off with about 80 kids signing up, but later more kids started to trickle in to about 90 kids over all. To me, it's great we were able to get that many kids out to fish... even with the notice of there NOT being any water at the camp site. The Forest Service did bring up water for cleaning fish, and someone donated a “Fish Cleaning Station” at the water tank provided to clean the fish. I would like to give that person a great big hug and thank you. This year, the fish were larger than last, by about 1 to 3 inches. But, there were lots of nice trout brought in at the checking station. I was totally amazed at the amount of parents that took the time to bring their children up to the lake just for the Derby. That was fantastic! I am disappointed that the Six Rivers Forest Service did not make a bigger effort to get potable water to Fish Lake camp, but I'm proud that the Orleans Forest Ranger, Nolan Colegrove, made such a big effort to provide water for cleaning the fish, and that the Recreation supervisor, Chris Trunkey, made such an effort to allow the families that did camp, as comfortable a time as possible - even though there was no potable water available. Trunkey even made an effort to contact all of the people. Now that was extra effort from a USFS service person. Fishing: Fishing has been slow due to the water flow releases being dropped back to summer time flows of 450cfs, and the summer weather with temperatures of up to 104 degrees. Right now, the best places to fish are the deep cool holding waters and early mornings. Mid-Klamath: Iron Gate Dam is releasing 1,090cfs today. Trout fishing should be fair to good in the upper reaches (I-5 to the dam). From the Seiad Valley down to the mouth the river looks good but the moss has taken over and that would make fishing very hard. Water temperatures have gone up a lot and that is going to make fishing even harder especially with the moss and the higher water temps. The best bet is to try to find cold water streams that are inflowing to the river. Lake Conditions: (due to a computer malfunction I only have a partial report). These are from last week’s report. Whiskeytown is 99% of capacity (an increase of 0%) with inflows of 1,788cfs and releasing 1,526cfs into Clear Creek and on to Keswick. Shasta is 85% (a decrease of 2% and 2ft) with inflows of 3,290cfs and releasing 7,624cfs, Keswick is 90% of capacity (a decrease of 2%) with inflows of 9,499cfs and releasing 9,695cfs; Oroville Lake is 68% capacity (a decrease of 0% & minus 2ft), inflow is 1,752cfs and releases are 2,511cfs; Folsom Lake is 96% of capacity minus 1% & minus 1ft.) inflows are 2,137cfs and releases are 3,847cfs. Trinity River Flows and Conditions: These are only partial readings! Lewiston Dam is releasing 509cfs into the Trinity River with water temps of 51.3 degrees and air is 52 at 10:00am today. Limekiln Gulch is 0.0ft at N/Acfs, with water temps of 0.0 degrees. Douglas City is 6.4t at 470cfs, water temps of N.A degrees and air is N/A. Junction City is 2ft at 539cfs. Helena is 9.5ft at 592cfs with water temps of N/A. Cedar Flat is 3.1ft at 714cfs. Willow Creek is estimated at 883cfs and air is 74 with water at N/A. Hoopa is N/Aft at 1,100cfs with water temps of N/A. Flows at the mouth of the Trinity River at Klamath River are estimated to be 6,149cfs. Klamath: Iron Gate Dam releases are 1,090cfs. Seiad Valley is 2.2ft at 1,260cfs. Happy Camp is estimated at 1,360cfs, Salmon River is 2.2ft at 470cfs, Somes Bar is estimated at 1,810cfs and Orleans is 4.5ft. at 4,155cfs and the Klamath River at Terwer Creek is 8.9ft at 4,400cfs, with water temperatures of N/A degrees. Flows at Smith River, Dr. Fine Bridge are 5.3ft at 517cfs. The low temperatures for Valley last week were 51 to 54 and the high was 104 with 0.00in of rain with a season total of 68.48in of rain and a total of 4.15in of snow. Temperatures in the valley next week are expected get up to 91/49 degrees with sunshine for the next couple of weeks. Expect hot daytime weather and cool nights. 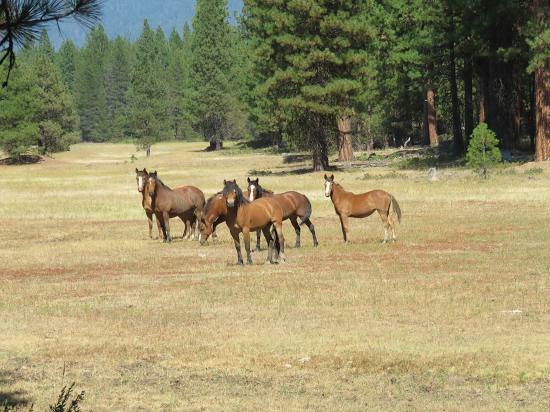 Wild Horse Renaissance – Is Catastrophic Wildfire Changing Perspectives?